It’s rhubarb season! I still have some frozen rhubarb left over from last year which needs to be used up! Rhubarb is a tart vegetable with thick, celery-like stalks, the only edible part. The rhubarb leaves are poisonous and should NOT be eaten. Chop and discard the leaves. Choose stalks that are crisp and brightly colored. Keep fresh rhubarb wrapped up in a clean tea towel for up to 3 days in the fridge. 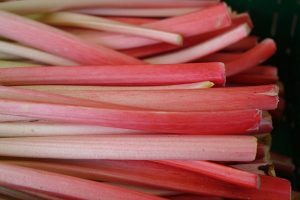 If you haven’t used rhubarb up by then, chop it up, store in an air-tight container or bag and freeze for up to a year. Rhubarb is the original “sour soother” – it is very tart and is usually combined with other fruits or sweetener to make it more pleasant to eat. By itself, one cup of rhubarb has 10 mg vitamin C, 350 mg of potassium and 2 g of fiber. Enjoy this tart vegetable stewed as a topping for pork and chicken. Cook equal amounts of chopped rhubarb with dates for a tasty spread to put on a sandwich or as a topping for cheese. 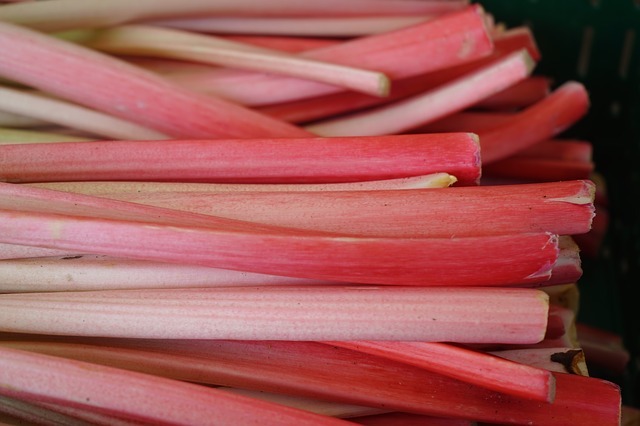 Enjoy rhubarb in your baking….muffins, loaves, cakes, pies. One pound of rhubarb yields about 3 cups chopped or 2 cups cooked. Below is a tasty muffin recipe to use up your rhubarb. It uses oatbran, an ingredient with high amounts of soluble fiber. 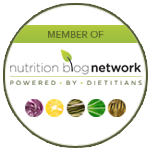 Soluble fiber is helpful in lowering cholesterol and in stabilizing blood sugar after eating. 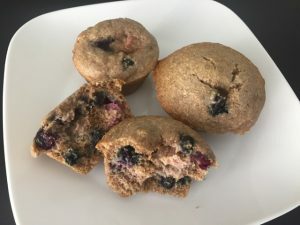 Enjoy this blueberry rhubarb muffin with a dollop of yogurt, or a glass of milk to help add in some protein. Enjoy! My mother in law introduced me to the combination of blueberries and rhubarb when she made a blueberry-rhubarb pie. 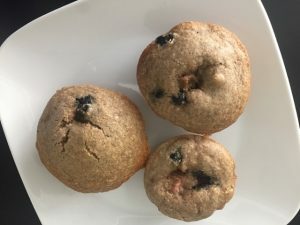 This blueberry rhubarb muffin recipe is moist and tasty, and is a nice way to switch up your breakfast or afternoon snack (muffins were gobbled up by my 2 children). This recipe is adapted from Leslie Beck's Strawberry Rhubarb Muffin recipe. In a large mixing bowl, stir together flours, oat bran, baking powder, baking soda and cinnamon. In a medium mixing bowl, mix together milk, eggs, sugar, oil and vanilla. Add the "wet" ingredients to the "dry" ingredients until combined. Fold in rhubarb and frozen blueberries. Lightly mist muffin tins with vegetable oil spray. Fill muffin tins with muffin batter until ⅔'rds full. Bake for 20 minutes. Remove from oven. Allow to sit in muffin tin for a few minutes before removing muffins from the tin. To make these muffins snack-sized, use mini muffin tins. Adjust baking time to be ~13 minutes. Yield for this recipe will 48 if using mini-muffin tins.